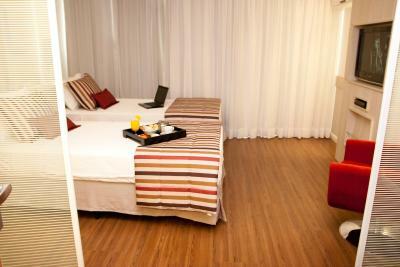 Lock in a great price for Hotel Mercure Brasília Líder – rated 8.7 by recent guests! Beautiful room modern. Breakfast with large choice. Bed. Accurate attendance and highly trained staff. 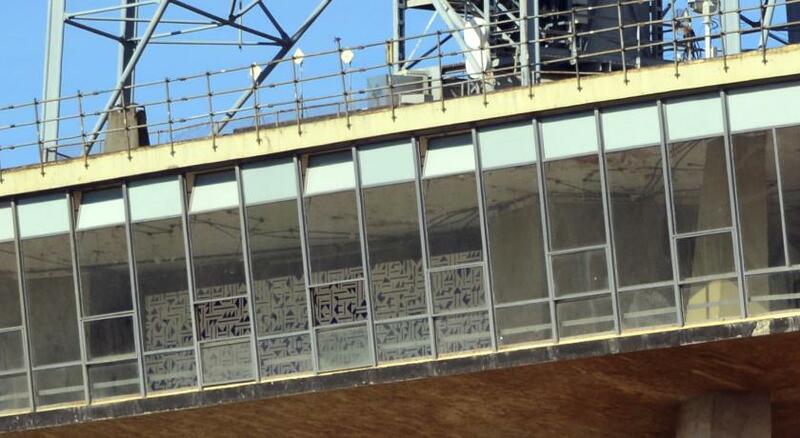 I suggest the floors at the top of the building because they will have a proper view of the city. greatly surprised with everything, great breakfast !! Quartos modernos e muito espaçosos. Cama grande e excelente, confortável ao extremo. Chuveiro nota 10. Ar condicionado também excelente, muito silencioso. O Mercure compreendeu bem as necessidades dos viajantes. Voltando a Brasília, sendo possível, me hospedarei novamente no Mercure Líder. 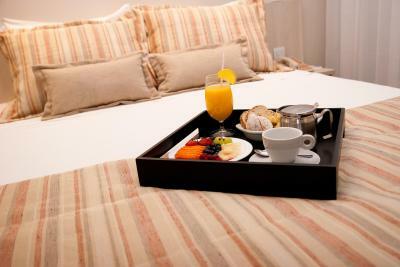 Quarto muito limpo, cama perfeita, café da manhã muito bom!!! Quarto muito confortável e o pessoal do café da manhã , muito atenciosos..
Café da manhã excelente. Quarto limpo, cama confortável. Nada a reclamar. 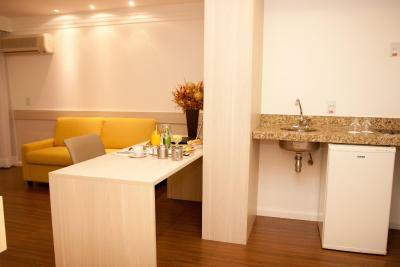 Hotel Mercure Brasília Líder This rating is a reflection of how the property compares to the industry standard when it comes to price, facilities and services available. It's based on a self-evaluation by the property. Use this rating to help choose your stay! One of our top picks in Brasília.The 4-star Mercure Brasilia Lider offers an outdoor pool, sauna and bar in a privileged location in the Asa Norte district, 1.2 mi from downtown. Free WiFi is available in hotel rooms. 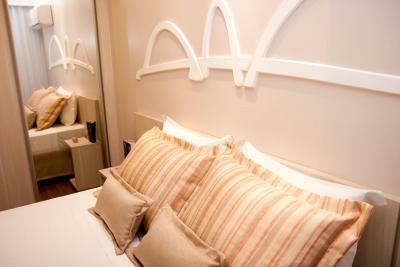 Each contemporary styled room here includes air conditioning, a balcony and private bathroom with a hairdryer. 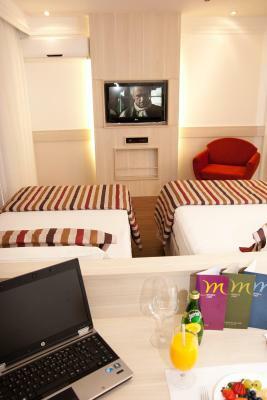 In addition to modern architecture, the Mercure Brasilia Lider provides a business center. There is also a restaurant on the terrace, where guests can savor a varied breakfast buffet and international dishes between 06:00 and 23:00. A special menu is available for kids. 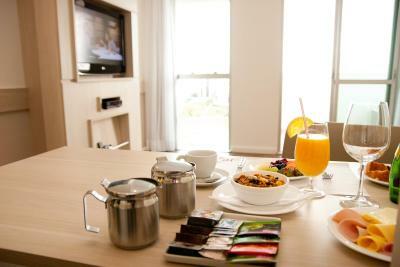 Lots of restaurants, bars, nightclubs and cultural attractions are within walking distance of the hotel. Furthermore, you will find a shopping mall in the nearby, as well as the popular political buildings of Brasília. Brasilia International Airport is 9 mi away. 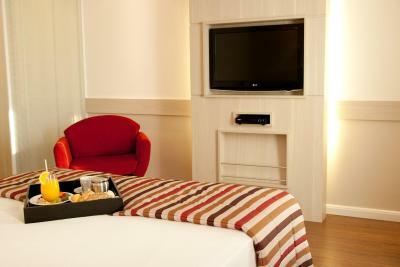 When would you like to stay at Hotel Mercure Brasília Líder? This air-conditioned room features balcony. The private bathroom comes with a hairdryer and shower. This air-conditioned room features a balcony. The private bathroom comes with a hairdryer and shower. 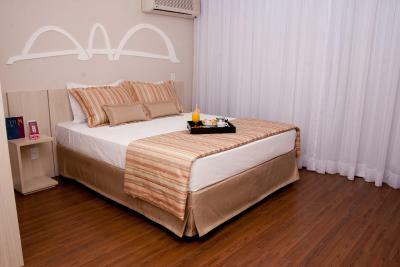 This air-conditioned room features extra space, as well as a living area with a sofa bed. There is a balcony and kitchen with microwave, stove and sink. The private bathroom comes with a hairdryer and shower. 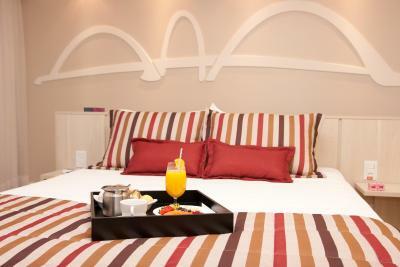 This air-conditioned suite features extra space, as well as a living area with a sofa bed. There is a balcony and kitchen with microwave, stove and sink. The private bathroom comes with a hairdryer and shower. House Rules Hotel Mercure Brasília Líder takes special requests – add in the next step! Hotel Mercure Brasília Líder accepts these cards and reserves the right to temporarily hold an amount prior to arrival. great disappointment. the cleanliness of the room was poor (hair in the bathroom and dust in the room), the safe didn't work and as there were no anti-noise windows on a busy street, it was really loud. Appliances from the 1990s. Unhelpful staff, I requested room change due to the mentioned problems, but it didn't happen. I have stayed in Mercure hotels before and thought there were good, but this just didn't match international standards as it seemed very poorly managed. I booked the hotel to my daughter and on check in a copy of my credit card and passport and a written consent had to be sent by me otherwise my daughter would not be able to check in. I always book through booking and this is the first time it happens. I hope all my data, which is under your responsibility, is protected. The bathroom could be renovated. A little traffic noise. They could offer some complimentary water and tooth paste. Clean, good stuff's, very good shower and bed. Good view. Old, low quality towels and bed clothing. It's pity that it is not possible to diner in the restaurant of this hotel tonight.